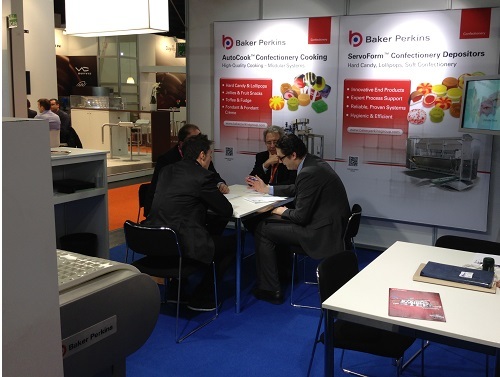 Baker Perkins focused on the potential for new, high-quality deposited candies, lollipops and soft confectionery at ProSweets in Cologne, January 27 to 30, 2013 (Hall 10.1, Stand C-048). One shot ServoForm™ depositing systems can combine up to four components into a single piece in a range of different patterns, shapes and formats. They offer greater product quality and variety, with lower energy and production costs, compared with traditional methods such as die forming, starch mogul or cut and wrap. The latest ServoForm™ lollipop technology has the potential to generate an array of innovative high-quality flat lollipops. For the first time, an unusual shape, as well as the colour and pattern combinations in the candy, can enhance the visual appeal of flat lollipops. Embossing the surface is another new way of increasing the interest and variety of round or shaped lollipops. Multi-headed ServoForm™ depositing systems are used for ‘long term’ three-layered hard candy products with a genuine ‘sandwich’ appearance. ‘Long term’ layering involves a dwell time between each deposit, allowing the first layer to form before the next one is deposited. This clear separation gives a true ‘layered’ effect, with different colours, textures and flavours: a popular application is a sandwich of crystallized Xylitol between two layers of sugar-free hard candy.